One thing you can say about hiking all the way up here is that it makes beer tastes even better when you get back to the bottom. Our Beer of the Month hails from Karl Strauss, which has been a part of the vibrant San Diego brewing scene since 1989 and operates a number of brewpubs in Southern California. I've enjoyed Karl Strauss's Red Trolley Ale on trips I've made to San Diego and now I can find it in the Bay Area, since Karl Strauss has recently expanded its distribution into Northern California this summer. And how has Northern California taken to this San Diego interloper? "Our Nor Cal expansion is exceeding our expectations," exuded Melody Daversa, Certified Cicerone and Karl Strauss's Marketing Manager in response to my e-mail. "We have received such good feedback from the entire Bay Area and we've sent up three times as much beer as we originally forecasted." As for any hopes that we might see a Karl Strauss Brewpub in Northern California soon, I'm afraid Melody largely dashed those hopes when I inquired about that. "At this time, we don't have a Northern California Brewery Restaurant in the plans, but you never know!" Oh well. As for Red Trolley Ale, this malt forward, complex red all is one of my favorites. It's a little toasty, with sweet caramel and toffee flavors plus a fruity character I can't quite put a finger on (is it dried apricot?) with a restrained, barely noticeable earthy hop finish. Red Trolley Ale won a gold medal at the 2012 World Beer Cup and a whole bunch of other medals in beer competitions over the past few years. And the good news for those of us up here in Northern California, we don't have to venture down to Southern California to find out why. You've probably heard about a zillion times that goals are important in running. Races always give training a direction, and my training was kind of going sideways for a few months now. Of course, there were good reasons. For the first time in a long time, my kids from a previous marriage were with me all summer. There will always be races to run, but you only get one chance to raise your kids, so running took a back seat to that. Then I dislocated my left shoulder in late July and lost a couple weeks of running from that. So I signed up for Theta Breakers, a 10k this October 7th put on by Stanford University's Kappa Alpha Theta sorority to raise money for Child Advocates of Silicon Valley, and organization dedicated "to providing abused, abandoned, or neglected children with an advocate to serve as a voice in court." I could have signed up for the San Jose Rock 'n Roll Half-Marathon, but am not really ready for big race like that, or in shape to do a decent half-marathon. A smallish charity 10k seemed like the right goal to shoot for. 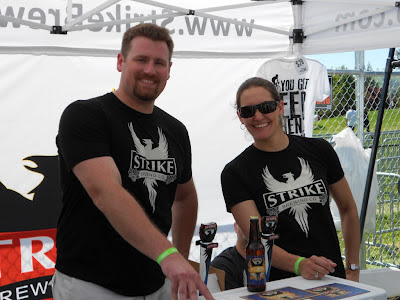 It’s no wonder Bay Area brewery newcomer Strike Brewing was formed by three athletes. They would need to be in good shape to survive their exhausting schedule they’ve undertaken in the past nine months to introduce their beer to the Bay Area. I first took notice of Strike back last February when I first tried their Brown Ale, and promptly made it Beer of the Month. Brown Ales are not usually the beers that grab my attention, but Strike’s was full of roasty flavors with hints of chocolate that raised it above the ordinary. It’s part of Strike’s Session Series Beers, with a focus on drinkable, flavorful, and lower alcohol beers. So what's happened with Stike since then? I caught up with Strike CEO Jenny Lewis who took time out of her busy schedule to answer a few questions via e-mail. Brewmast Drew Erhlich chimed in with some thoughts, too. Q: How have the first nine months gone starting out as a new brewery in the Bay Area? ﻿Jenny: It has been incredibly busy in a good way. We’re at festivals, events, tastings, athletic functions and other events every weekend and a lot of week nights. There is no free moment - literally. And it’s pretty cool now that organizations, companies, and festivals are approaching us and we don’t have to go seek them out like we did the first few months. Word gets out quickly about something new coming to town, and we have a lot of enthusiastic supporters. The beer has also been well received. We’re always trying to decide what new beer to do next, what will become year-round and what we’ll do as a seasonal. Once we’re in our own facility, this will get easier too. There’s not as much room for experimentation with contract brewing, because if it hits the tanks, it is going to be for sale. We very quickly hit about 60 accounts. Now we’re working on getting more chain distribution to increase sales volume. I’ve been doing a great deal of driving trying to get word out and hit the best craft beer pubs in each city from Berkeley to Monterrey. So again, it’s just a lot of time getting the brand name out there, but it’s been rewarding seeing the growth in just 8 months. Q: When do you plan on moving into your own brewery? Jenny: As for moving into our own brewery, I am working as fast as I can to close on the capital right now and purchase equipment. Most likely we will end up in San Jose and aim to be open and functioning by the spring. It will be a production brewery with a tasting room attached, so that we can hold tours and events and tastings, but we will not serve any food. Once we are in our own space the sky is the limit on the types of beers that Drew will brew. I know he has an affinity towards sours right now and wants to try barrel aging a few things. We’re also going to do some more beers that will appeal to the growing demographic of women drinking craft beer. So we have a few things in the works to launch by next summer. We’re also planning on canning at least one or two beers, probably the Blonde to start with. Plus, we will always have an array of session beers available, since the Strike Session Series is an extremely important differentiator for us. Q: You mention plans to appeal to women beer drinkers. What beers do you think will appeal to women?" Jenny: Usually when I think making more beers that appeal to women, I think adding more session beers, possibly with some interesting fruit combinations, and more spices. I have a lot of fun right now mixing the beers we already have, sort of like Leinenkugels does in Wisconsin. In particular the Imperial Red and Wit go pretty well together oddly enough. I like being able to pick out all the different smells, spices and flavors so I assume other women would too. We’ve been toying with the idea of adding some local fruit beers, sourcing them in the Bay Area and making something crazy with it. They would be one-time releases and probably part of the session series. Drew: It's hard to say what specific flavors would appeal to women rather than men. I could only say that beers with more complex flavors might appeal more to women. I have read in a few places that women are much more receptive to flavors and able to pick them out better than men. I haven't heard a reason for this, and I don't know why, but it doesn't surprise me. So, as a result I think women have the ability to better savor beers and identify more of their flavor components. However, it all comes down to what that one customer likes or doesn't like. No matter how receptive a woman may be to flavors, if she doesn't like hops, an IPA won't be "her" kind of beer. I personally think it is rather presumptuous of larger companies who come out and say, "This is a new beer for woman!" when in reality, there is no way they can say that all, or a vast majority of women, will like this beer. Some women may be put off by the fact that they are trying to make a beer specifically for them, insinuating that they can't handle their other beers, which only appeal to men. So rather than say "we are designing a beer for women," I think it should more be a change in perception. Something like, "We aren't creating a new beer just for women because no two women are the same.” Women love flavor and want beers to satisfy that. That is why the world of craft beer is perfect for women. There are countless numbers of amazing beers that are bursting with flavor, and with the vast number of styles to choose from, every woman can enjoy the adventure of finding one that she truly loves." Just like running, brewing for a living is both a lot of hard work and a lot of fun. And the best thing is we all can enjoy the rewards of Jenny and Drew’s hard work. Here is the round-up for month's Session, where I've asked everyone to predict how many US breweries will exist in 2017. As for who wins the prize, forgive the sappy cliche' but you're all winners, and I'll gladly buy a beer for each of you whenever our paths might cross. I have every intention of blogging about beer five years from now, and if your prediction is the closest and your still out there in the beer blogosphere, I will find you. And whatever beer you've earned, I promise it will be a good one from a brewery that currently does not exist. I must admit to a having a small hidden agenda with this Session topic. I'm not only a Beer Geek, and a Running Geek, but also a Techie Geek in real life. I've personally witnessed bubbles and consolidation in obscure industries such as fiber optic components, solar panels, disk drives, carbide tools, and internet retailing. And while craft beer has a distinctly different character and structure than those industries, all the new breweries going online and lots of brewery expansion pricked up my bubble antenna, which was reflected in my post predicting 2,697 breweries in 2107, where I saw a lot of choppy waters ahead for new brewing entrants. What did other people think? Alan McLeod of A Good Beer Blog also had concerns about a brewing crash wondering "Are we nearing something like that? I dunno. I have lived through enough recessions now to know they come out of now where..."
As for the rest, in semi-numerical order, here's what the rest of the fearless predictors had to say. Over 5,000 David Blascombe of Good Morning... makes a number of interesting comparisons between the United Kingdom, where there is 1 brewery per 70,000 people, versus the United States, where this ratio is 1 to 150,000. (If the United States had the UK's brewery to person ratio, it would currently have 4,430 breweries.) He goes on to add "What I’d like to see is more smaller breweries supplying smaller communities. The best scenario I can imagine is a number of brewpubs opening across the country. Places where people can gather and drink beer. London has an increasing number of places which are like this." 5,001 is what Brian Yaeger of Red, White, and Brew expects five years from now, based on the comparative popularity of wine and beer. He notes that while beer and wine are have roughly the same popularity, the number of breweries stands at 28% of the number of bonded wineries. So what will all these new breweries look like? According to Brian, there's going to be plenty of "Tiny, nano, pico, "boutique," retirement-plan, post-law-career, I've-always-love-homebrewing-and-all-my-friends-said-I-should-go-pro breweries." 4,252 In their Session debut, The Brew Gentlemen wisely keep it simple and double the current number of breweries. In justifying their prediction, they are encouraged by "the incoming class of beer-frenzied greenhorns.....arriving at legal age in a much more colorful market than their elders did. This is, for the most part, the first wave of new drinkers who grew up around craft.....so they’re already used to having better options. This young crowd has an enormous amount of buying power, and thus, the ability to significantly boost the market share." 3,189 Alan McCormick of Growler Fills looks around his home state of Montana, which has the second highest breweries per capita in the United States, in coming up with his prediction. He has doubts we'll see brewery it continue at the current rate, as some markets are likely to reach a bit of a saturation point, and expects a " temporary ingredient shortage that will push the pause button on a few." And I supposed I'm biased, but you got to hand it to a beer blogger who's completed a marathon. 3,125 is the number Jon Abernathy of the Brewsite predicts, by assuming the 47% growth rate over five years will continue, although he thinks any number between 2,500-4,000 is reasonable. But he confesses he really has no idea, since at one time, he thought his home town of Bend, OR had reached it's limit at 8-9 breweries, but now there are 15 active breweries in Bend, and another six in the planning stages. Around 3,000 opines Sean Inman of Beer Search Party by the year 2017, adding "I firmly believe that way more than 5.7% of people want to drink more than corn water. It may not be a majority but I do see 15% as not out of the realm of reason.......But there will be an upper limit to craft beer. (And those will be interesting times to write in, let me tell you)." 2,831 is the number Chris Staten of DRAFT Magazine throws out. Chris writes from his perspective as a beer journalist to share what he hopes the future of beer to look like, and hopes in five years, the brewing industry will "...keep me, the entire staff of DRAFT and the rest of the beer media on its toes so that we begin each work day wondering “what’s new, what’s unsampled?” and not fall into the laziness of beer snobbery and know-it-allism." 2,620 Stan Hieronymus of Appellation Beer calculates this number from a proprietary formula based on differing estimates for breweries in 1879. He also quotes Oskar Blue's founder Dale Katechis from a recent interview on the subject of new brewery entrants. Make sure you check out the interesting comments to his post. 2,589.5 is the prediction by What We're Drinking, who shrewdly adds a half brewery to break any ties. Looking around his home town of Dayton, OH, he writes: "I do think that 3-4 local, small scale breweries can be sustained within a city the size of Dayton..." and goes on to add "If growth becomes the model that these breweries pursue, however, I would expect to see the numbers drop, not only locally, but nationally" It's worth noting the population of metro Dayton, OH is about 840,000. If we extrapolate 3-4 breweries in that city to the United States population of 310 million, that works out to 1,100 to 1,475 breweries nationwide. 1 A dire prediction that one megabrewer will control the world comes from Jon Jefferson of 10th Day Brewing, who also proposes the opposite scenario that breweries may proliferate like restaurants. What will happen in the end? According to Jon, "Either way it will be the passion of those who are opening the breweries that will determine where we end up." Desire Fellow beer runner James at Beer Bar Band extols the virtues of balancing beer and running (yes!). He goes on to compare Australian breweries in his home country to those of the United States, and concludes with "I’m not a betting man, I'll end with less of a prediction and more of a desire for 2017. In five years time I'd like to be actually working in the beer industry…maybe with a craft beer shop, maybe with a brewpub (better get that lotto ticket), more likely in communications support for the craft beer industry" Let's raise a glass and wish him good luck with that. Finally, we'll end with Bryan Roth at This Is Why I'm Drunk, who provides a number of sobering facts on the subject without making a prediction, concluding with "Craft beer is on the rise and it’s going to be a pretty damned exciting ride. Better hop on this train before it really leaves the station." We're all with you on that, Bryan! So thank you all once again, and see you over at 99 Pours for next month's Session, where we'll wax poetically on novelty beers. The Session #67: Getting a Little Ahead of Ourselves, Are We? For this month's Session, I've asked everyone to predict how many US breweries will exist in 2017. When it comes to beer in America, there's no question the good guys are winning. The popularity of so called craft beer from small scale regional breweries shows no signs of saturation, and considering it constitutes only about 9% of the country's beer consumption, the upside potential of craft beer appears enormous. But I see storm clouds on the horizon causing choppy waters on the wide open seas of brewing. Often in industry bubbles, the central product remains in high demand, but the structure of the industry is unsustainable or the market becomes saturated with too much product, causing prices to plummet and firms to struggle to remain profitable. While I don't think a bubble is going to hit the American brewing industry, many breweries are going to see a lot tougher business climate, and I think it's a fairly good bet we're going to see some sort of correction. The current growth rate of breweries five years from now is going to slow down considerably. There are two things that point to this. 1.) Earlier this year Beer Business Daily cited that between 2009 to 2011 the number of breweries in the US increased by 22%, with the number of package breweries increasing by 25%. Meanwhile, shelf space increased by only 3.6%. I couldn't find any similar statements on bar and restaurant sales, my guess is that the situation is similar. And while a over 50 different taps or a store shelf full of beers of all possible description are a thrill for beer geeks, for most consumers it is confusion. At the current rate of growth, at some point too many breweries are going to be pursuing too little shelf space and too few tap handles, if we haven't reached that point already. 2.) A whole bunch of brewing capacity is about to go online. Already, Sierra Nevada, Lagunitas, New Belgium, Oskar Blues, and probably a couple others I forgot about are opening up a second brewery. Plenty of other breweries have announced major expansion plans and lots more have probably gone unannounced. While craft beer is growing in popularity, it is a slow steady growth and there seems to be a real risk the craft brewing industry may end up producing way more beer than it can profitably sell. There are plenty of economies of scales in the brewing industry and the larger players are in positioning themselves to exploit them, the smaller players in less of a position to make the necessary investments do so. That said, I don't think there will be a craft beer bubble where large numbers of breweries become powerless to avoid failure. I look around and see mostly well run firms producing a quality product that's in demand. It defies belief to think someone like Boston Beer, New Belgium or Sierra Nevada is going to all of a sudden turn predatory and start buying up a lot of competitors or try to force them out of business. But the growth of new breweries and the capacity of the industry looks to be outpacing demand which is going to make for tougher times for new breweries starting out of the gate, and the weaker ones are more likely to fail. It also looks like craft beer is going to get a little top heavy, with a handful of large national players, and a bunch of smaller regional breweries focusing on their niche' markets.